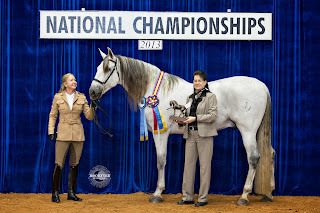 Corredor II Champion Hunt Seat Pleasure, Spanish Senior Stallions, winner of Andalusian Stallion Functionality, and reserve Champion USDF Musical Freestyle. 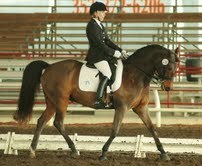 Owned by Sandy Werner of Alachua FL, Corredor is a 15 year old imported PRE Stallion. Sandra Werner's Corredor II scored a 74.8 in the Final run of the Show with Karel Van den Neste at the end of the lead. The powerful moving, 16.1 hand bay stallion was also reserve National Champion Spanish Stallion at the 2012 IALHA Finals in Ft. Worth Texas. A special thanks to Tonia Wener and all her hard work and support to the entire team! Evelyn and the 5 year old Canadian Sport Horse gelding, MIrror Image are bound for the Championships in October. 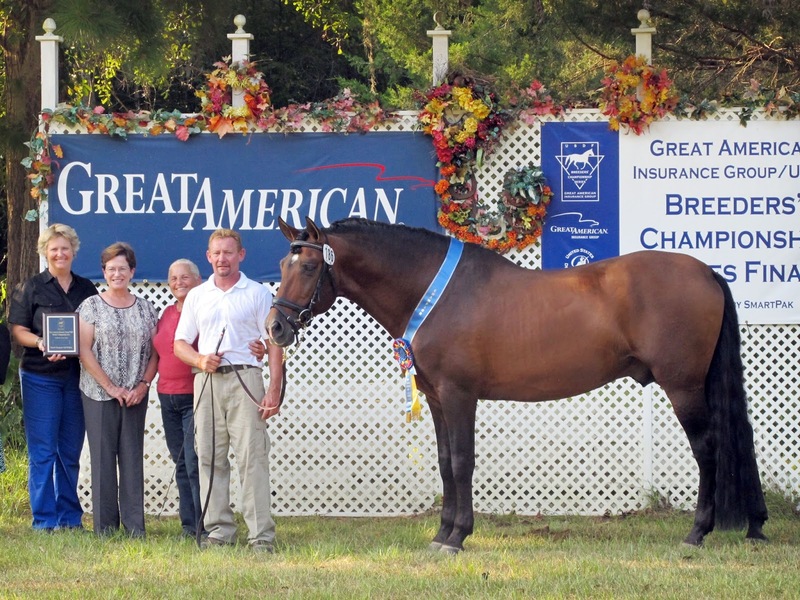 Not only did she qualify in two shows, but she has only owned the 16.3 hand bay gelding since April. So many of you are still saying, "So What?". What follows is the rest of the story. In June, in a freakish moment (we think Image was bee stung) she fell when the horses panicked and bucked and broke 10 ribs and spent 5 days in the ICU with a chest tube front and back draining fluid. Everyone told me that she would be 5 months out of the saddle, but they don't know Evelyn. She started going to the gym and doing excercise classes and by the end of July she ordered me to get her up. It was nerve wracking for me, especially because I had to leave the country for two weeks and she was going to be unsupervised. But, by the time I came back the team looked pretty strong. The top photo is Evelyn grooming in Atlanta during July (about 5 weeks post accident) and the bottom photo is Image and I training under her watchful eye during her layup period. Oh, by the way Evelyn celebrated her 68th birthday in the hospitol.....She is an inspiration to the whole team! 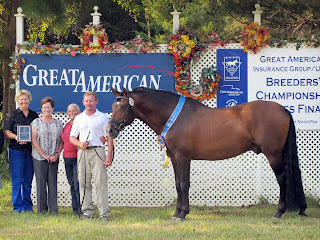 Rodeo won both Grand Prix classes this past weekend in Conyers, Georgia despite the high heat and long travel conditions. The 17.2 hand gelding has adapted to the southeast heat in his first season in Florida in the summertime. Last year Rodeo travelled to New York to escape the brutal Florida summer conditions. He had been a native of California all his life. This summer, I knew it would be a stretch to show him in these conditions, but I couldn't resist the chance to take him to the Georgia International Horse Park in Conyers. I adapted the warm up to 15-20 minutes, working just transitions and a few elements of the test with many long rein walk breaks in between the excercises. By the time he went into the show arena, he was barely breaking a sweat. I had to rely on the movements that are reliable at home, without schooling them ahead of the test. Some of them worked, and some of them didn't. By the second day in the Special, every movement was reliably there. The scores were low for the whole show, but I was happy with Rodeo and I feel the quality of his work, and the movements are improving. Of course, there is no perfect horse, but this big guy is doing the stuff and he is happy doing it and that is what classical training is all about! 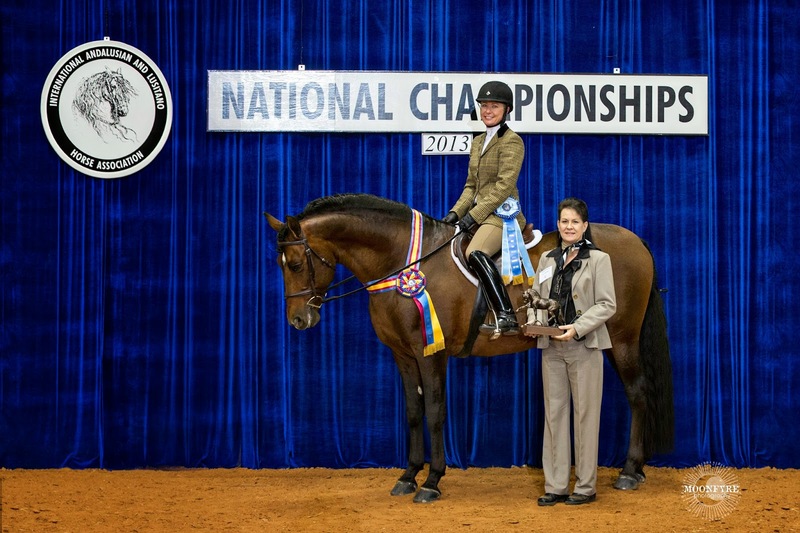 Nan Troutman has purchased the 10 year old Dutch warmblood gelding, Winston Sir and is eager to start her dressage show career with the Sunrise Farm show team. Nan has a beautiful horse farm in southern Georgia, but will keep Winston at SRF in training while she learns to ride and show him. Winnie is a stunningly handsome 16.2 hand bay gelding by Sir Sinclair. His endearing personality has charmed everyone who has met him. I am excited to have Nan come and train and show with us and know she will love the ride on Winnie! 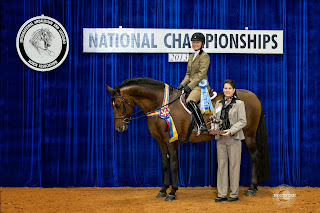 Ducati FH (Donatelli x Susquehanna) had a perfect show in Tampa June 8-9, 2013. The 5 year old mare won all 4 first level tests and with scores to 71%. She received an 8 on her gait score and an 8 for her walk (medium and free walk). I was pleased that this hot red headed mare is so level headed in the show arena and it just proves that good breeding shines through. Ducati FH is owned by Jillian Costello of Melbourne Florida. Karen Wolfsheimer and Murphy (Suntime Celebration) won the third level dressage and the Preliminary test 2 driving competition at the Citrus Cup. Karen and Capri (Flower of Capri) also won the First Level test three and made her debut at second level. Karen has been working with me for almost three years, having brought Capri to me when she was just under saddle. These two horses prove that Morgans are perhaps the most versatile breed I have worked with. We go for miles of trail riding on Karen's vast estate in Micanopy, too. Look for the Morgan Pas de Deux to come in the very near future! Ducati FH (Donatelli x Susquehanna), a 5 yr old Hanoverian mare, owned by Jillian Costello. This firey little redhead is going to make a great dressage horse one day. She was a bit scared in the covered arena in the ridden tests, but I felt moments of brilliance combined with moments of panic. MOre to follow on this fun horse. 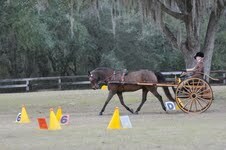 Evelyn and Image started their new journey down the dressage training highway last Monday April 11, 2013. This talented and gorgeous 5 yr old is destined for greatness and Evelyn knew he was for her the moment she sat on him. What a nice feeling that is!